Currently, we are moving towards a new era of WordPress website development. In WordPress, the availability of tools and plugins have increased exponentially, in which page builders are trending now. A page builder simplifies the entire process of website creation via an enhanced drag-and-drop editor. 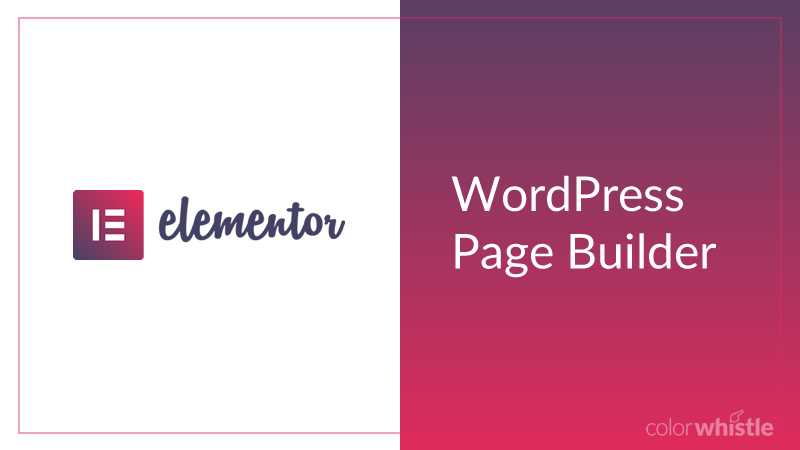 In this blog, we are going to discuss a famous page builder ‘Elementor’ which helps to build custom layouts for websites and comes with a lot of interesting functionalities. Elementor is the fastest and simple content editor in WordPress which can be quickly grasped by everyone. Below are some of the features available in the free version of Elementor page builder. Customize your website with the help of ‘drag and drop’ functionality. Lots of ‘widgets’ and nearly 300 amazing ‘templates’ are available. Not even a single line of ‘coding’ is required to customize websites. ‘Mobile editing’ helps you to view the page in mobile resolution so that you can make your website look better on mobiles. Write content directly on the page using an ‘in-line editor’. Get an overview of the entire page using ‘navigator’ and re-order it as per your requirement. Search bar for easy navigation between pages and dashboard. Reduce your time by adding ‘hotkeys’ i.e. keyboard shortcuts. Edits you make are automatically saved and backed-up. Pages can be drafted using ‘draft mode’. ‘Background gradients’ can be added to color the background of the page. Extra layer of image or color can be added above the background using ‘background overlay’. Background videos can be added to any page. Page sections can be separated using ‘shape divider’. Option to create one-page websites. Landing pages can be customized along with the header and footer using ‘Elementor canvas’. Font size, weight, style, decoration, line-height, and letter spacing can be easily customized. The ‘font preview’ in the panel helps you to choose the best. ‘Drop cap’ to improve the stylish look of the font by making the first letter of the blog look larger. ‘Text shadow’ effects can also be added to increase attraction. Control various sections using ‘section width and height’. Columns can be controlled by ‘ column width and gap’ including ‘nested columns’ (which we can sort all the inner sections). Title tags can be set for SEO improvement. Margin and padding can be set for sections, columns, and widgets. Using ‘z-index’ you can place any section, column, or widget either in the front or back. Create 100% responsive websites for mobile. Hide or show elements on any device as per your needs. Custom breakpoints can be added to adapt your website for mobile and tablet view. Price list widget to add catalogues, products, services and pricing for e-commerce websites development. Create and manage ‘Landing pages’. Rating star widget to gain trust among the audience. Pages can be built from scratch by using blocks and pre-designed templates. Reuse every custom page you create by saving it to the library. Include ‘Google maps’ to help users locate your business. Create a full-screen experience for users by adding image, gallery, and video lightbox. You can play a tune when users visit your website by using the ‘soundcloud’ widget. Give an interactive view to your website by adding hover and entrance animations. Set maintenance mode using ‘coming soon’ and ‘maintenance mode’ templates. Create add-ons and themes using API. Add custom CSS to section, column, widgets and pages. ‘Replace URL’ feature to redirect a page to the new URL. Using ‘version control’ you can go back to the previous version of any page. HTML code can be directly entered in the HTML widget. Options to reduce image size. Support for both RTL and LTR languages. Apart from the above, there are some paid Elementor features like dynamic content, 404 pages, TypeKit integration. Click here to learn more about the features of Elementor pro. Let us consider the most popular page builders to find out what makes Elementor stand out. Take a look at the below blog links to get a precise idea to determine the right page builder for you. WPBeginner compared Beaver Builder, Elementor, Divi Builder, Themify Builder, and page builder by SiteOrigin and concluded that Elementor is clearly the top choices’. CodeinWp compared the entire features of Elementor, Divi Builder, and Beaver Builder in a detailed manner. Our WordPress developers have worked with many page builders extensively including Elementor page builder too. We feel that the page builder has one or two minor quirks, but apart from that it is glitch free and comes with a solid number of elements. And best of all, you needn’t rely on annoying shortcodes to include any features. If you’re in search of a new page builder for your next project, you should definitely check out Elementor. Did we miss anything? Do you have any questions about something we did not cover? Leave a comment below!